Steve Curry knew where he was and what he had to do, he told The Lewiston Daily Sun in April 1988. Where he was was at AAA Pawtucket and what he had to do was pitch well, he told The Daily Sun. "I'm here (in AAA) and I've got to pitch here, so I can't really think about being called up," Curry told The Daily Sun. "They told me to put up some good numbers, so I'm going to do the best I can. I feel I can do the job (in Boston). But it's all up to them. I just go out and pitch." Curry did just that. And, by July, he was in Boston. By the end of July, his career in Boston, and in the majors, was over, Curry getting just three major league starts. Curry's pro career began in 1984, taken by the Red Sox in the seventh round, out of Manatee Community College in Florida. With the Red Sox, Curry started at short-season Elmira, going 6-4 over 14 starts. He moved to single-A Winter Haven for 1985, then AA New Britain in 1986. After his 1986 campaign, where he went 11-9, with a 2.79 ERA, Curry made the Red Sox' off-season 40-man roster, The South Florida Sun-Sentinel wrote. "I try to learn from every pitch I make," Curry told The Sun-Sentinel that November of his method. "After every game, I play the whole game over in my head 10 or 15 times, pitch by pitch. The things I did wrong I try to do right the next time I go out there." 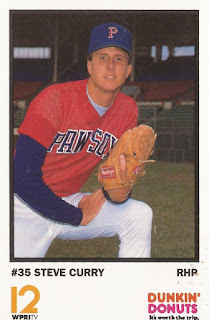 For 1987, Curry moved to AAA Pawtucket. There, he went 11-12, with a 3.81 ERA. He also threw a no-hitter that July. He then started 1988 back at Pawtucket. In July, he got his call. In three starts, he gave up 10 earned runs over 11 innings of work. The next spring, Curry was optimistic about getting back. "My manager called me in and told me I was going to the big leagues. I was so excited," Curry told The Toledo Blade the next spring of that moment he got his call. "Last year was more or less getting used to the atmosphere of being around a big league team. This year, I want to be a starting pitcher for them." But, while Curry played in six more seasons, he never got back to the majors. His 1989 campaign was an abbreviated seven outings at Pawtucket. His 1990 was just eight, between Pawtucket and an apparent rehab assignment in the Gulf Coast League. Then he missed all of 1991. Curry returned to play 1992 and 1993 in the Royals system, then 1994 with the Rangers at AAA Oklahoma City. His final year came in 1995, at independent St. Paul, ending his career.